Ducat is a great solution for all kinds of businesses. With this theme you will create an amazing project. Our product gives you the power to create a unique-looking website with an easy-to-use drag and drop page builder. 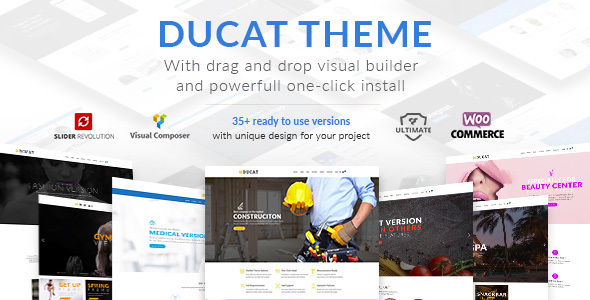 Ducat is a clean and trendy Responsive Multipurpose Theme designed with special attention to detail, and a clear focus on usability. Theme has beauty design and bunch of features to make your website stand out of crowd. Can be used for a lot of type of websites. You can choose from website templates as a quick start. Constantly we add new demos at users requests. Packed with everything you need to launch your site by this weekend!